Intensity of dental hygiene is enormous. We are made familiar with the notion of brushing our teeth twice a day right from childhood. Why? To get rid of weaker gums, cavities, bad breath and other related oral diseases. 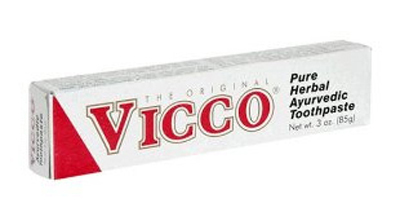 Talking about the Indian market in terms of oral hygiene, the concept of toothpaste is quite new. People went ayurvedic and herbal in the medieval era. But the last few decades have seen tremendous toothpaste marketing and campaigning in this field. India has become leaders and the toothpaste industry has shown impressive growth in terms of maintaining oral hygiene. Here are list of top 10 best toothpaste products in India that provide 24X7 germ shield protection. Have a look! Vicco Vajradanti is made of pure herbs in a completely original Ayurvedic formula. It contains no artificial ingredients or refined sweeteners and definitely no harsh abrasives or fluoride. Its effect stays on for a longer time and helps your teeth fight basic dental flaws such as plaque and weaker gums. This toothpaste is full of natural astringent, antiseptic, and analgesic properties. “Subah Babool tum jo karo toh din yeh tumhara ho”! 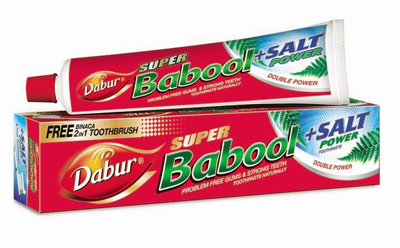 The most famous tag line of Dabur Babool Toothpaste says start your day with Babool and cleanse your teeth and your aura for the day at the same time. It is also recommended by dentists as it prevents swelling and bleeding of gums and keeps your teeth strong and healthy. It is available in different packaging in the market. 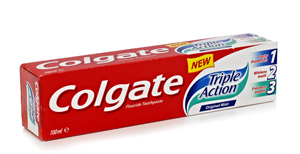 Colgate is one of the most popular brands in the Indian market. This one has been around for a long time now. It has been able to win the trust of million users owing to the dental and oral care it provides. It has been launching itself in the market with different names and uses from time to time. Colgate Dental Cream, Colgate Total, Colgate Sensitive, Colgate Max Fresh, Colgate Kids Toothpaste and Colgate Active Salt will be to name a few. They are available in small packages to bigger family combo packs. Pepsodent, a product of Hindustan Unilever Limited has been serving the market in terms of oral health care. Healthy gums lead to healthy teeth and pepsodent make sure that the former demand is fulfilled. Pepsodent Center Fresh, Pepsodent Germicheck, Pepsodent Whitening and Pepsodent Super Salt 1 and 2 are a few of its bi-launches to help fight against germs and cavities. It is most recommended by dentists in India. Close-Up is multipurpose toothpaste. It not only takes care of dental hygiene such as cavities, fresh breathe etc. but also acts as mouthwash. 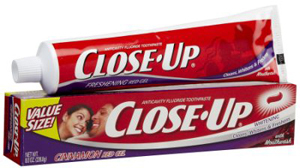 A product of Unilever, Close-Up was the pioneer brand that came up with the concept of gel formula in toothpaste in India. It also prevents bleeding gums. This product is available in different packages at different yet cheap prices in the market. Oral-B Pro-Expert is a combination of antibacterial fluoride and active clean crystals formula that protects your teeth against hardened plaque and provides a unique cleaning sensation after wash. It includes normal fluoride that comes handy in whitening and the Polyfluorite system acts as germ shield for your gums. It is available at affordable prices in the market. The best thing about Anchor White toothpaste is the ‘100% vegetarian’ concept. This concept make this toothpaste stand out from other leading toothpaste brands in the market. This teeth whitening toothpaste gives you healthier gums and also resists plaque formation. The antiseptic and analgesic properties prevent bleeding gums and other dental problems. It is available at affordable prices in the market in different packages. 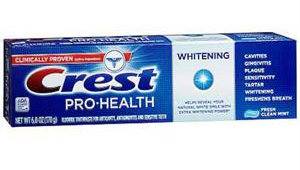 Crest helps in whitening and protect your teeth against cavities. It acts as germ shield protector and fight problems likes bad breathe, weaker gums, sensitivity and cavities. It is a children gum formula that provides protection against tarter build-up and other dental problem. It takes care of your total oral hygiene and keeps you fresh all day long. It is available at affordable prices in the market. Cibaca is a flagship of Colgate and is developed with a unique formula to fight against swelling gums and decay. Ingredients include Calcium carbonate, sorbitol, sodium Lauryl Sulfate, Silica, Sodium Silicate, Flavor, Sodium Carboxymethyl Cellulose, Sodium Monofluorophosphate, Sodium Bicarbonate, Sodium Saccharin etc. which make sure to help you get rid of bad breathe and keep you orally fresh all day long. 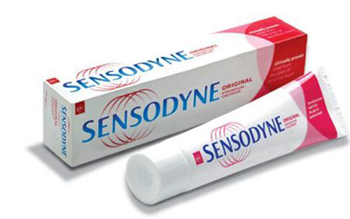 The concept of sensodyne product is new in India. It is especially manufactured for sensitive teeth. Plus it aids in skin whitening and at the same time protect your tooth enamel. This teeth whitening toothpaste is very helpful for those suffering from problems relating to tooth sensitivity to ease the pain. It is suitable for both children and adults alike. Also check out the top Ayurvedic Herbal Toothpaste in India. Pepsodent is not so affective .but dabour red toothpaste is very affective to make our teeth strong.some people loss their front teeth but before loss your teeth you should regularly brush with dabour red toothpaste.